Most of the time, you can just use a PDF file without thinking about what lies ‘under the bonnet’. But sometimes you want to find out about the actual objects inside a PDF file. 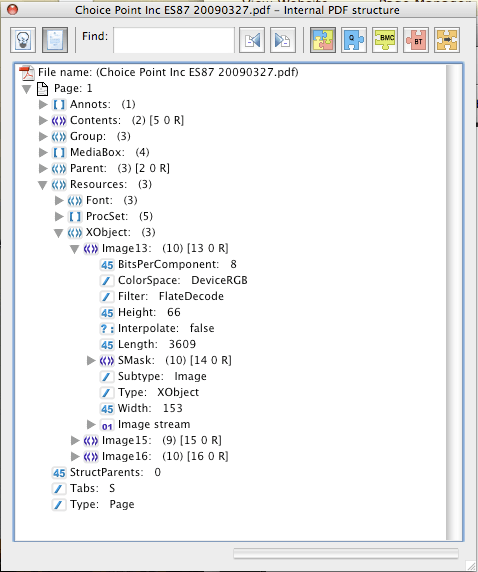 I need to do this quite often to debug JPedal (our Java PDF viewer and PDF to Image converter) but it is also useful if you want to know about the colours used and how the PDF might print or whether it has any useful text. It also allows you to see how big the images inside the PDF really are and whether they can be easily extracted. I used to open the PDF in a text editor but this is not an ideal solution. Not only can it be quite hard to decipher, but if the PDF is encrypted or contains compressed data and objects you cannot view these. This allows you to see the actual PDF objects much more clearly. You will still need your trusty and well-thumbed copy of the Adobe Acrobat PDF specification but it has saved me a lot of time when needing to see what is happening inside a PDF file. This post is part of our “Understanding the PDF File Format” series. In each article, we aim to take a specific PDF feature and explain it in simple terms. If you wish to learn more about PDF, we have 21 years worth of PDF knowledge and tips, so click here to visit our series index! Want to try a Java PDF Library? Try JPedal for free, download the free trial Jar. Thanks, this was very helpful! In Acrobat XI, this is hidden in the Edit … Preflight … Options … menu. Thanks for adding note on XI. Adobe likes to hide away this very useful feature! how pdf stores data?please explain in detail? In Adobe Acrobat DC (2015 Release (classic) | Version 2015.006.30279, running under Windows 7 Enterprise) this useful feature is hidden under Tools > PDF Standards > Preflight. What is less-than-obvious (at least to me) is where the Mac context menu in the first illustration in this article came from. It pops when you click the Options pull-down. The second illustration comes from clicking Browse Internal PDF Structure and drilling down several hierarchy levels by opening flipper triangles. 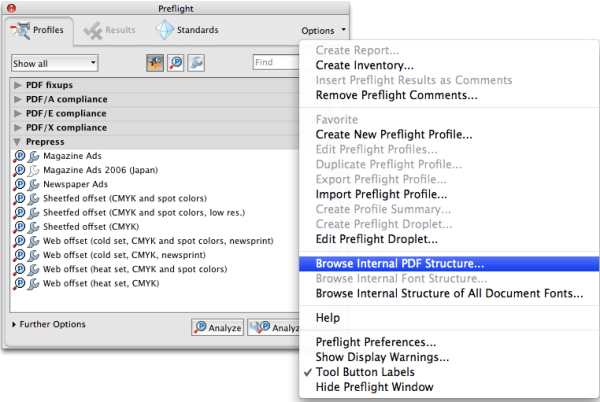 Advanced – Preflight – Options – Browse Internal PDF structure. There is also a option to browse the font data there. Like you I find the format is not great.